The new trimester started on Monday and I’m teaching a class called “Designing Experiments and Studies.” It’s a statistics class, so we’re starting with a bit about normal distributions. Most of the students in the class are juniors, but they’ve had very little instruction in statistics. They didn’t get it from me last year, so any knowledge that they might have is probably from middle school. S1: The boy would weigh more compared to other boys because the boy is 0.25 pounds away from being one standard deviation above the mean, while the girl is 0.5 pounds away from being one standard deviation above the mean. Since the boy is closer to being one standard deviation above the mean, the boy weighs more, compared to other boys. S2: But, 0.25 lbs for the boys is not really comparable to 0.5 lbs for girls because the standard deviations are different. 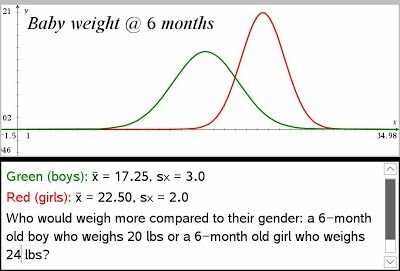 I agree that the boy weighs more, but it’s because the boy is about 92% of the way to being one standard deviation above the mean, while the girl is only 75% of the way to being one standard deviation above the mean. S1: What does that matter? S3: It’s like if you’re getting close to leveling up (I know this sounds really geeky), but if you’re 10 points away from leveling up on a 1000 point scale, you’re a lot closer than if you’re 10 points away from leveling up on a 15 point scale. Even though you’re still ten points away, you’re a lot closer on that 1000 point scale. S4: But you’re comparing boys to boys and girls to girls. You’re not comparing boys to girls. S2: Yes, you actually do have to compare boys to girls, in the end, to know who weighs more for their own group. Me: How did you figure out that the boy was 92% of the way to being one standard deviation above? S2: Well, the boy is 2.75 lbs more than the mean weight and 2.75 / 3.0 is about .92. I did the same thing with the girl and got 75%. At this point I showed them a table of z-scores, kind of like this one and we talked about percentiles. Looking at the table, they determined that the boy was at about the 82nd percentile, while the girl was at about the 77th percentile. Therefore, the boy weighed more, compared to other boys, than the girl weighed, compared to other girls. I have two sections of this class, and this recreation of the conversation happened in both classes. I’m so happy when my students make sense of mathematics and reason through problems. I never had to tell them the formula to figure out a z-score, or why that might be useful or necessary. They came up with it. Yesterday was a “Shadow Day” at Baxter Academy. That means that most of our students were off on a job shadow of their choosing. I’m anxious to hear about the shadows that they were able to arrange during the snowiest week of the winter, so far. I would have checked in today, but we have another snow day – the third this week. Anyway, while our students were off doing their shadows, we had about 120 prospective students, interested in attending Baxter Academy next year, join us for a “simulated day.” The students were placed into 16 different groups, each led by a couple of current Baxter students through a day of classes that included a math class or two, a science class or two, humanities, and an elective or two. I co-taught our modeling class with one of our science teachers. This is the introductory math & science class at Baxter. It’s technically two sections, but they are integrated and teamed up so that the two teachers are working with the same groups of students. Sometimes we meet separately, as a math class and a science class, and sometimes we meet together. I’ve written about the class before, and the kinds of modeling we have made them do. But what do you do with a bunch of 8th graders who are are with you for only an hour? Introduce them to problem solving through with this TED talk by Randall Munroe. And then take a page from Dan Meyer’s Three Act problems – a page from your own back yard: Neptune*. A brief launch of the problem and off they went. Not every group was able to answer both parts of the question: How big is the Earth model and where is it located? But most groups were able to come up with a solution to at least one part. The point of the day was to provide a realistic experience of what it’s like to be a Baxter student. We grouped them together with others they didn’t know before walking into the building. We asked them to collaborate to solve a problem they’d never seen before. We asked them to do math without giving them directions for a specific procedure to follow. We asked them to share their results in front of strangers. We gave them an authentic Baxter experience. *For more information about the Maine Solar System Model, visit their website. It’s really a rather amazing trip along this remote section of US Route 1. I’ve done it – I’ve driven through the solar system. My Functions for Modeling classes are ending on Tuesday. These are the introductory math classes at Baxter Academy. This course is paired with Modeling in Science, which has a focus on science inquiry and the physics of motion – kinematics. 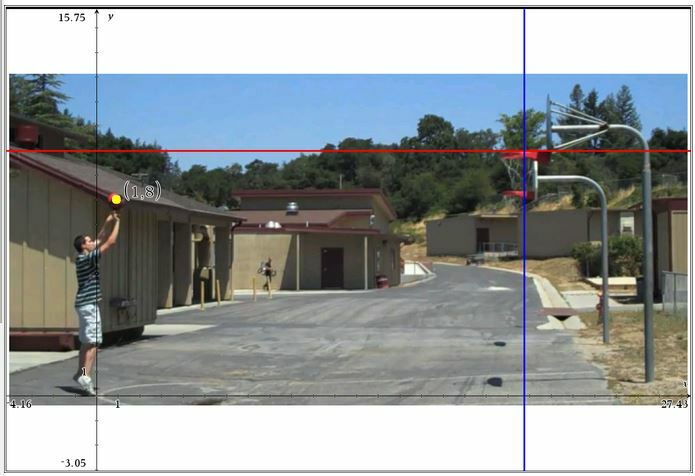 The final assessment is a ballistics lab, where the student groups have to measure the launch velocity of their projectile launcher and, along with some other measurements and a few guesses, identify the best launch angle and launch point to fire the projectile at a vertical target. The students are not allowed to have test shots or simulated shots. They are expected to gather the necessary data and complete all of their calculations before testing their theory with one, single shot. The target is fairly forgiving, but students are still amazed when their predictions result in a projectile going through the target. I teach half of an integrated math & science modeling class. On the math side, we focus on functions and a little bit of right triangle trigonometry. The science side is all about motion, one dimensional and two dimensional – hence the trigonometry. We’re now entering the final few days of the trimester, and have gotten into that 2D motion part. Did I mention that this is the introductory math/science class for 9th graders at Baxter Academy? We started with Dan Meyer‘s Will It Hit the Hoop? concept, slightly modified. Showed Act 1 video, but captured this picture for analysis. Interesting conversation begins. Many students are convinced that the ball will fall short of the hoop because “it is slowing down.” What makes them think that, I wondered. Maybe because up until this point, the conversation in science has been about constant velocity motion, in one dimension. Showed Act 3 of course and those who were sure the ball would go in were vindicated. But their comments still nagged at me. Maybe they just need more experiences – this was, after all, just the first day of 2D motion. We watched part of an episode of Mythbusters, the one where they fire a bullet and drop a bullet and have them land in the same spot at the same time. It’s really a good episode. It really helps to drive home the fact that the forward motion of the bullet has nothing to do with how much time it takes to fall to the ground. It means that horizontal and vertical motion can be thought of, and modeled, independently of each other. On the science side of things they had developed the kinematics model: . So then we adapted that model for horizontal and vertical motion. We went back to the basketball shot. Analyzing the photo against the graph, we estimated the the initial position of the ball is at (1, 8) and the final position of the ball would be (19.75, 10). We also figured that the ball was in the air for about 1.8 seconds. From this information my students calculated the initial horizontal and initial vertical velocities to be 10.4 ft/s and 30 ft/s, respectively. Class was over, so I left them to work that out for homework. Next day, I had them check in with each other and then asked, “How did you think about this problem?” Overwhelmingly, they agreed that the launch velocity must be the average of the horizontal and vertical velocities. This happened with both groups. I asked them why they thought it should be the average. I asked if they thought the launch velocity should be greater than 30 ft/s, between 10.4 ft/s and 30 ft/s, or less than 10.4 ft/s. They were convinced that the launch velocity should be somewhere between 10.4 ft/s and 30 ft/s. 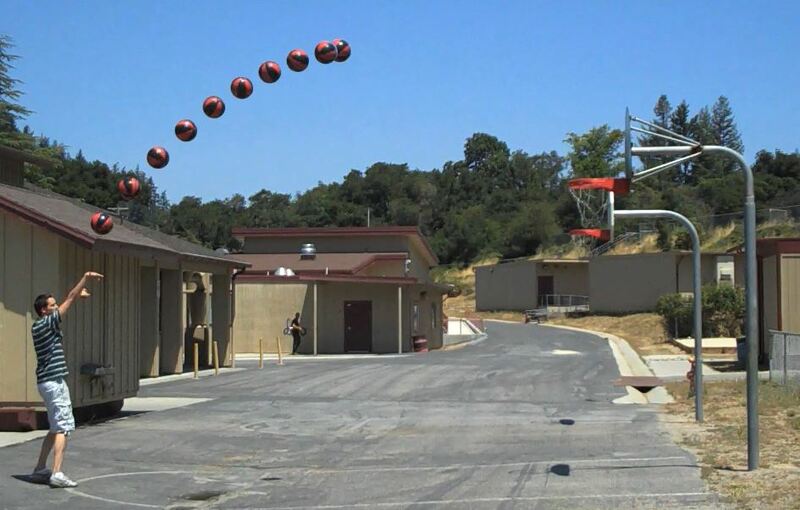 Some thought that it should be closer to 30 ft/s since the ball is “going more up than over,” but that it would still be less than 30 ft/s. A student in one of the classes convinced that group that it couldn’t be the average with the following reasoning: Suppose that the ball was thrown straight up. That means that the vertical velocity is 30 ft/s and the horizontal velocity is 0 ft/s. If the launch velocity is the average, then that would be 15 ft/s, but we know that the launch velocity is 30 ft/s. So it can’t be the average! So, of course I asked, “Then what could it be?” And they went with the idea that it must be the sum of the two velocities. But that would give us a launch velocity greater than 30 ft/s. We talked about this for a few minutes. They weren’t sure. Only after seeing this picture did they make any connection to a right triangle, or Pythagorean Theorem, or trigonometry. It had taken the better part of an hour to arrive at this conclusion, and then it took only 5 minutes to find the solution. What would have happened if I had jumped directly to the right triangle representation? They would have had a quick solution, but they wouldn’t have had the opportunity to think about whether or not the launch velocity is the average of the horizontal and vertical. Maybe you think it was a waste of class time to allow my students to engage in such discussion. Maybe it was, but I don’t think so. My students had to take some time to construct meaning. They had to confront their misconception and convince themselves and each other that taking the average didn’t make sense. Sure, I could have told them, it would have been more efficient, but would that really have helped their understanding? That’s the name of one of the classes I’m teaching this term. We have trimesters. So each term is 12 weeks long and we have a week of “intersession” in between the terms. Except that this first term is not quite 12 weeks. The expansion area of the building wasn’t quite finished when we started school, so we had some alternative programming called “Baxter Foundations.” It included stuff like my Intro to Spreadsheets workshop. Classes started this week. And one of my classes is called Problem Solving with Algebra. I came up with that name, and I honestly don’t know exactly what it means. I have a rough idea, but it could go in a lot of different directions. Mostly, I want my students (and all the students taking this course) to think and puzzle and use algebra and solve problems. Then I got an email that Jo Boaler has published a short paper called The Mathematics of Hope. In it she discusses the capacity of the human brain to change, rewire, and grow in a really short time based on challenging learning experiences. We’re not talking about learning experiences that are so challenging that they’re not attainable, but productive struggle. Challenging learning experiences that produce some struggle, but are achievable. The ones that make you feel really good when you solve them. You know the ones I mean. So I decided to start this class with a bunch of patterns from Fawn Ngyuen‘s website visualpatterns.org. The kids are amazing. They jumped right in. Okay, so I taught most of them last year and they know me and what to expect from me, but seriously. Come up with some kind of formula to represent this pattern. Kinda vague, don’t you think? And I’m pushing them to come up with as many different formulas as they can, and connect those formulas to the visual representation. For example, an observation that each stage adds two cubes to the previous stage would result in a recursive formula like: C(n) = C(n-1) + 2 when C(1) = 1 (which is a recursive formula for pattern #1). On Tuesday, different groups of students were assigned different patterns. Wednesday, each group presented what they were able to figure out. Some had really great explicit formulas, while others had really great recursive formulas. A few had both. 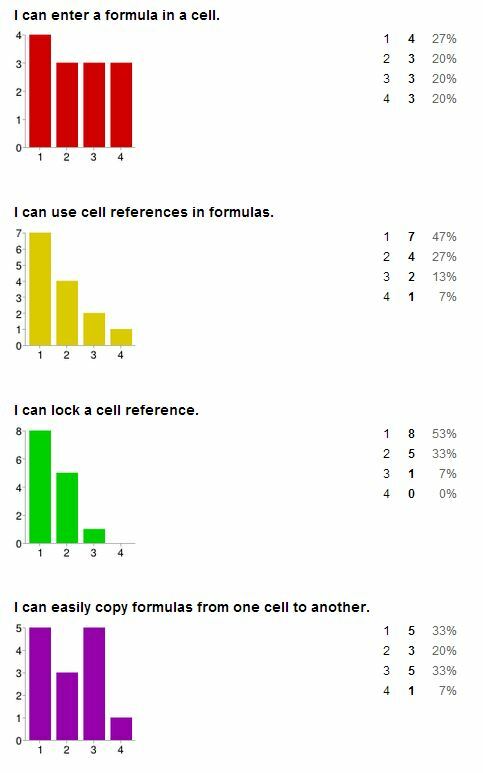 Most were stumped at creating an explicit formula for pattern #5, pattern #7, and pattern #8. Then, Dan Meyer posts this: Real work vs. Real world. Makes me think – as always. What am I asking of my students? This is real work – they are engaged and they are thinking. Sam, and the others, were not going to be defeated by a visual pattern. The fact that they are working in a “fake world” doesn’t matter. 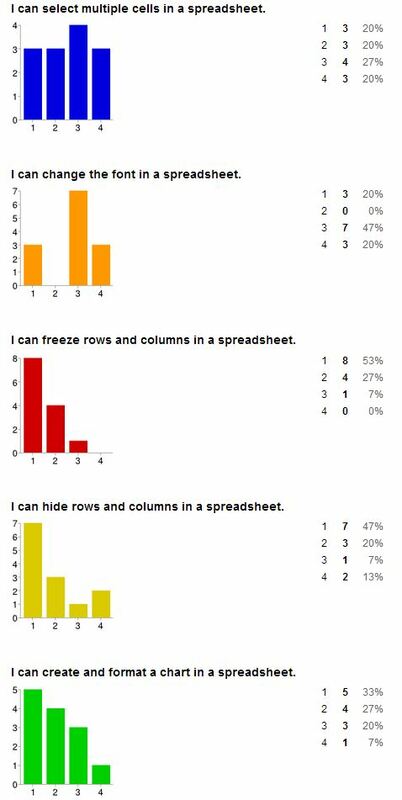 Today I led two groups of students through an introduction to spreadsheets as part of our Baxter Foundations workshops. Our framing question was, “How much is that Starbucks habit costing you?” Many students, of course, said $0, but we widened the question to include other vices, like Monster drinks, Red Bull, going across the street to Portland Pie every day, or down the street to Five Guys for lunch. And we broadened the question to, “What if you put your money into a retirement fund instead?” To make this real for my students, my friend Tracy admitted to her Starbucks habit and offered to be our real case study. Clearly, the sophomores were bringing more to the table than the freshmen. After all, they had been instructed in spreadsheets in their engineering class last year, but they were still a bit unsure of what they knew. 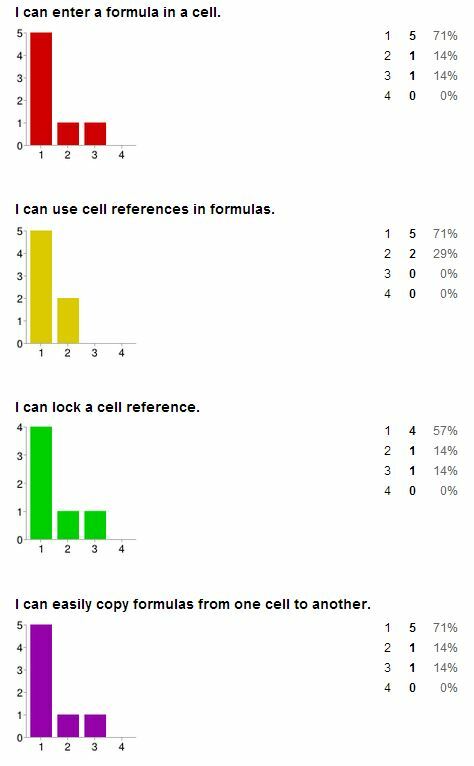 They thought they probably knew more than they had indicated, but didn’t know what I meant by “cell reference,” for example. And remember, I teach in Maine where 7th graders are given their own digital device. It used to be a laptop, but last year many districts changed to iPads. 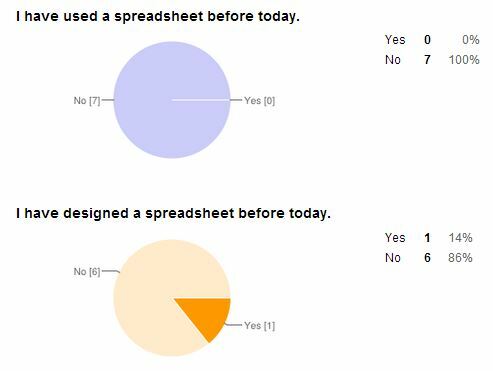 I would have expected the 9th graders to have had much more experience with spreadsheets, but I’m seeing that the switch to iPads is having an impact on that. Very sad. I began by explaining the situation: Tracy spends $x each day on her Grande Soy Chai at Starbucks. If we want to figure out how much she spending, and what she could be earning instead, what information do we need? And then I had them brainstorm for a couple of minutes. Information needed: cost of the drink, how much spent each month, and interest rate for the investment. But this is also part of problem solving. Take a few minutes to watch Randall Monroe’s TED Talk and you’ll understand what I mean. So here’s the spreadsheet that we came up with. Tracy spends a lot of money on her Grande Soy Chai. But, it’s possible that the drink adds some value to her life and is worth the price. Investing early and for a long time really can pay off, even if the amount invested isn’t all that much each month. 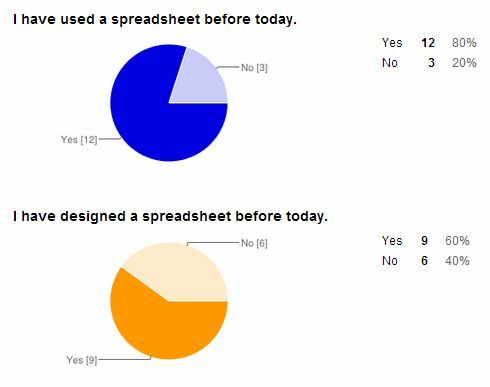 Learning about spreadsheets can be fun if you have an interesting question to answer.